Jovit Baldivino Live in Gensan! Right after the show of Yeng Constantino and PGT finalist Mang Rico at the Lagao Gym last weekend comes another FREE SHOW presented by KCC Mall of Gensan. Jovit Baldivino, the young man with a golden voice who comes from a poor parents in Batangas and used to sell chinese dimsum before in a market to help augment family income became the first Pilipinas Got Talent grand winner. He wowed the viewers and left the judges tongue-tied on the final night of the competition with his rendition of "Too Much Love Will Kill You" by Queen. Generals, it's your turn to hear his voice and his music live. 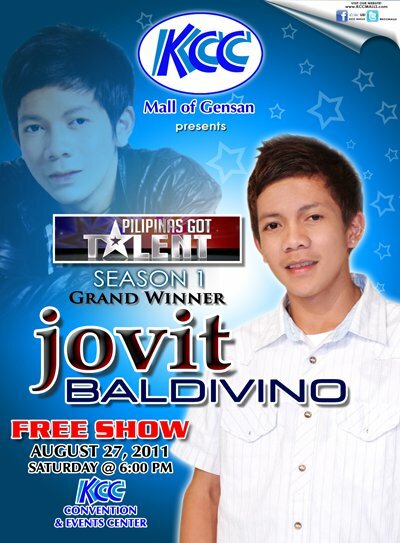 Catch Jovit Baldivino live at the KCC Mall Convention and Event Center on August 27, 2011 at 6pm. For updates, visit KCC MALLS on Facebook or call the hotline (083) 554-555.